Collier's Magazine in excellent condition. 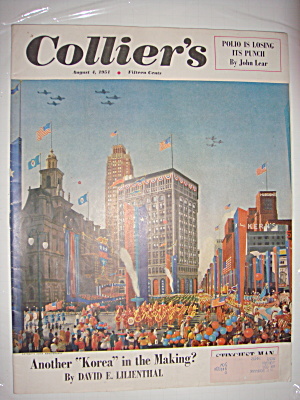 The date is August 4, 1951 and its cover depicts Detroit's 250th Anniversary. Articles include "Another Korea in the Making? by David E. Lilienthal", "Polio Is Losing Its Punch by John Lear" (including picture of patient in an "iron lung") and "Stingiest Man". Mailing label on front lower right corner. There's a Chesterfield Cigarettes ad on the back with Rhonda Fleming in full color. Inside there are ads for Ipana (full page b&w) with a typical 50's cowboy theme, Swift ham, Atlas tires with very cool images of one of those aluminum house trailers, "Willys" Station wagon ad (Jeep now) and an interesting article with numerous pictures about Napalm "Canned Hell"